GPS: N32° 55' 11" W99° 13' 45.4"
Holding command over the Southern Plains, Fort Griffin served as one in a line of western defensive forts from 1867 to 1881. Remnants of the fort remain today at Fort Griffin State Historic Site, which is also home to the Official State of Texas Longhorn Herd and offers camping, fishing, hiking, stargazing, and living history. Among the fort's ruins are a mess hall, barracks, first sergeant’s quarters, bakery, powder magazine, and hand-dug well that are all deeply tied to Texas history. The campgrounds, located on the banks of the Clear Fork of the Brazos River, provide visitors with an opportunity to relax under large shade trees, enjoy the playground, catch catfish in the river, or hike nature trails connected to the campground. 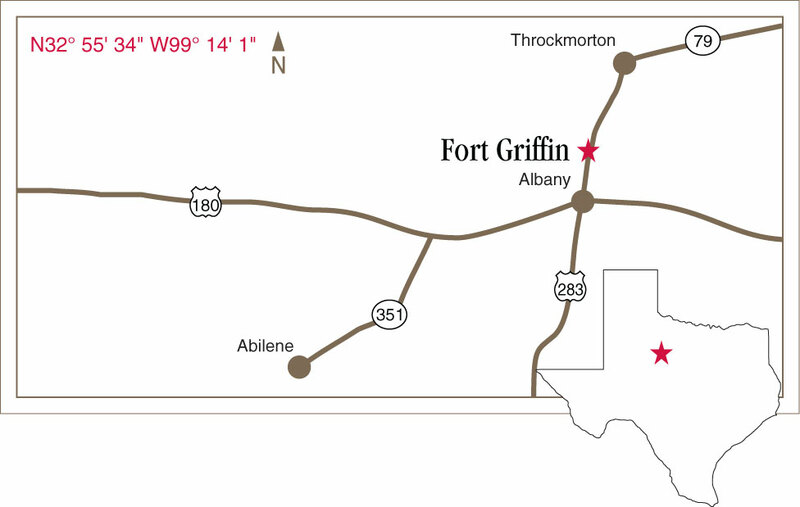 Due to the vast ranches surrounding the property, Fort Griffin has minimal light pollution. The result is an astronomer’s oasis with great skies for viewing constellations, planets, and galaxies at Fort Griffin’s monthly stargazing events. Fort Griffin is a State Archeological Landmark and listed in the National Register of Historic Places. What do wildflowers and large groups of Scouts have in common with baby longhorns? They are all sure signs of spring at Fort Griffin State Historic Site! Download the Fort Griffin visitors guide (PDF) for a snapshot of the site. Help us preserve Texas history. Donate now to support the preservation, education, and outreach activities of Fort Griffin.